EU leaders are preparing for a final push in the negotiations on the UK's renegotiation of its EU membership as fine tuning on cutting benefits for EU workers and eurozone governance remain the main sticking points. 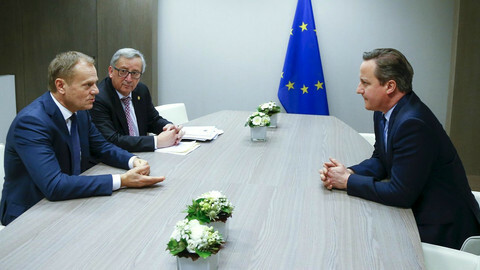 EU leaders will gather on Thursday (17 February) afternoon in Brussels to kick off the meeting from which British prime minister David Cameron hopes to produce a deal for the UK that would enable him to put the UK's EU membership to a referendum by June. "The intention of [EU Council president] Tusk is clear: he believes this week is the best timing to reach a new settlement for the UK and the EU," a senior EU official said. However, Donald Tusk in a letter to EU leaders on Wednesday warned that "there is still no guarantee that we will reach an agreement" and urged them to remain constructive. Highlighting the importance of the next 48 hours, he added: "There will not be a better time for a compromise." Leaders at the summit will be armed with a "war room of lawyers", as one EU source put it, to tackle the remaining political and legal issues in the draft deal. 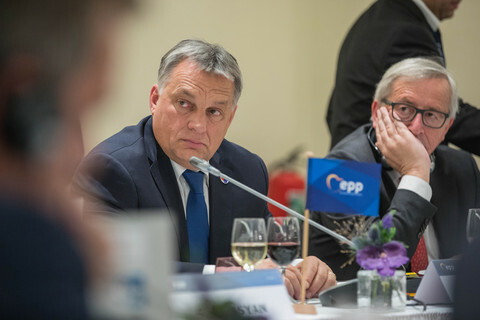 Several sticking points remain, with curbing in-work benefits and the indexation of child benefit for EU workers in Britain still raising serious political concerns among eastern European member states. "We see it as a UK-specific problem, that should not create possibilities for other member states to restrict access to free movement," a source said. Eastern diplomats want to "ring-fence indirectly" the so-called safeguard mechanism that would allow Britain to curb benefits, by making it specific to the British public service system, in order to make sure other member states will not try to imitate the UK's restrictions. "We would need a document that makes this clear. It's going to be in the text in some shape or form," said another diplomat, quipping it should be possible as "we have all night" on Thursday night to discuss it. Eastern Europeans would also like to see guarantees that restricting in-work benefits would only be applicable to newcomers and not to workers already in Britain. They are also keen on making sure that the indexation of child benefit - lowering benefits in cases where the children do not live in Britain, though the parent does - will not apply to other benefits, such as pensions and unemployment support, and will also only be applicable to newcomers. "I don't have a feeling the UK has a problem with that," a source said. The UK argues the proposals are aimed at tackling the abuse of Britain's generous welfare system. Leaders will also have to decide how long the UK can use the mechanism to curb benefits, an issue so sensitive it was not even touched upon by diplomats and lawyers who prepared the draft texts for the negotiations. 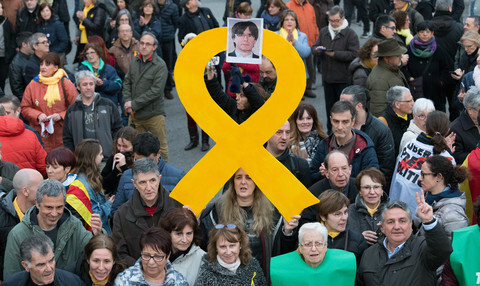 Another issue to be dealt with at the two-day summit is eurozone governance, on which the UK has asked for safeguards, in particular, the opportunity to bring discussions on proposed decisions by the 19-member group to EU summits if they endanger the economic interests of those countries outside of the single currency union. On this point, the French lead the countries concerned that the UK might be able to delay or even veto crucial economic and financial decisions in the euro area. "We have to ensure integrity of the internal market and avoid that non-euro countries can block further integration, have a veto. The question of how many non-euro countries can raise specific issues to a higher level still needs to be discussed," a source said. The UK on the other hand argues that the safeguard is not a veto, not a holding brake, and not a change in the legislative procedures of the eurozone. The UK's request to be left out of what the EU treaty defines as "ever closer union" is another issue to be discussed by leaders, where different interpretations of deeper EU integration might clash. "For some it does mean deeper integration, for others it does not, we have to find a common position," an EU official said. Some countries, like Belgium, are concerned negotiations will open the door for an 'a la carte' union, and that European integration might be stalled. Others - less concerned about future integration, in some cases simply because in their original language the phrase means more of an alliance than a close political union - don't see the phrase as a problem. 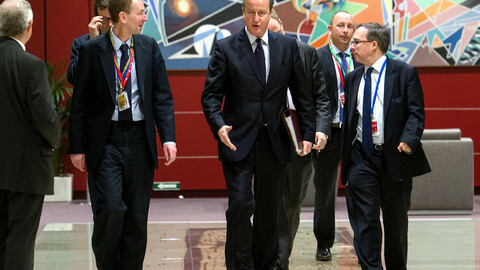 Incorporating the UK's requests into the EU treaty is also a tricky point. While the deal with the UK will be legally binding and carved in international law, Cameron wants to make sure some elements are incorporated into the EU treaties at a later point, as he has promised British voters. "All four issues are addressed and must be addressed in respect of the current treaty. We modify nothing in the treaties and we do not start any treaty revision procedure," said a source, reluctant to take Cameron's wish on board. On Thursday afternoon leaders, along with European Parliament president Martin Schulz, will hold a first discussion on the UK's requests based on the draft deal put together by Tusk's team. Then they are expected to discuss migration over dinner, while Tusk and his negotiators hold bilateral meetings and hammer out a new draft. Leaders will then come back to the 'Brexit' issue to discuss it overnight, and again on Friday morning for what an EU official called "English breakfast that can turn into brunch." Many are unhappy that Cameron is risking the UK's EU membership, that he is requesting more special treatment for the UK and that he is using the politically charged term "migrants" for EU citizens. "It's the first time we use treaties to solve the problems in one political party in one member state," a diplomat said. "It's a miracle we could come all this way, when we see the different positions." But the official said "there is good will" among EU officials and diplomats to make sure Cameron gets a legally binding deal he can campaign with successfully. 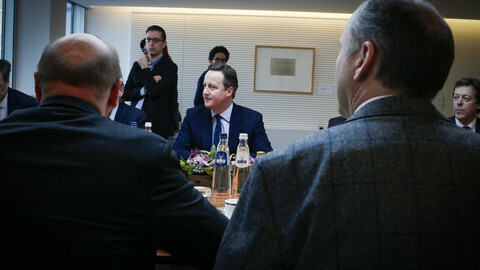 "What we can do is to have a fair deal, which would allow Cameron to campaign. And he will get it. It will be up to him now how he can translate it to British voters," another source said. 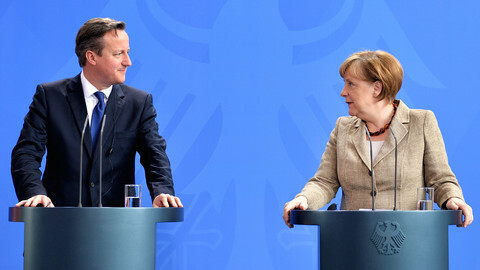 He added: "The aim is that he [Cameron] can go home from Brussels with a deal that would be sellable to voters." 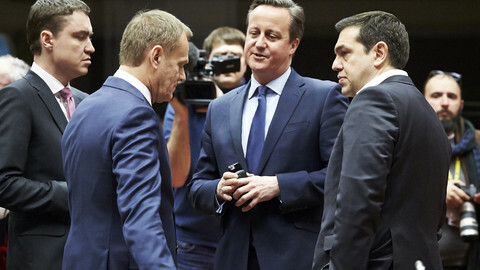 Tusk issued a warning in his letter: "It is our unity that gives us strength and we must not lose this. It would be a defeat both for the UK and the European Union, but a geopolitical victory for those who seek to divide us." 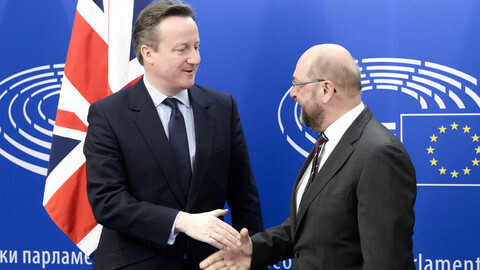 EU Parliament president Martin Schulz said after meeting British PM David Cameron that he wants a fair deal for the UK but cannot guarantee the outcome of parliamentary processes. British PM David Cameron seeks assurances from MEPs that they will not pick apart a deal on the UK's renegotiated EU membership, which may be agreed this week. 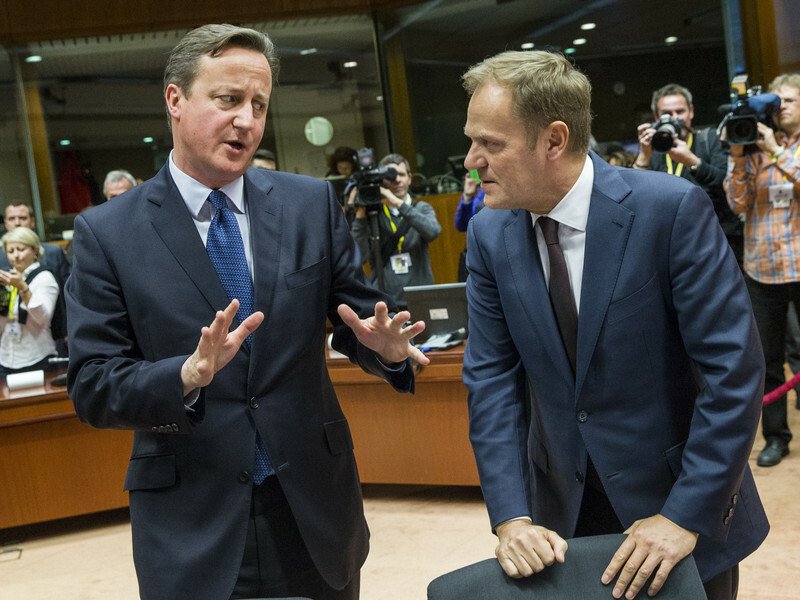 British PM David Cameron is holding final pre-summit talks in Brussels on Tuesday before confronting his own anti-EU ministers on Friday. Overnight talks for an agreement with the UK dragged on into the afternoon Friday, as EU leaders were still searching for compromises on social benefits, financial governance and treaty change.